The Original Torklift Fastguns are made of high-impact powder-coated stainless-steel. 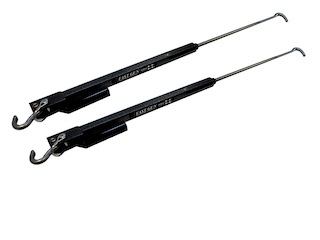 Each precision-made piece is spring loaded and includes spring tension indicators and Torklift's Lifetime Guarantee. Why are they called "Fastguns"? With the revolutionary Fastgun Quick Disconnect feature your campsite camper leveling process is FAST; by allowing you to easily use your electric jacks to level your camper when the camper is left on the truck. This avoids the hassle of leveling blocks under your tires. 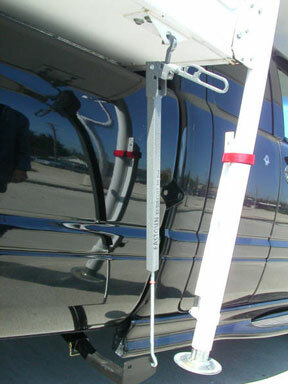 The Fastguns are the fastest turnbuckles on the market. Torklift Fastguns are 100% tool free and 100% lockable (locks sold separately). This "Long Range" version is designed for under-bed tie downs and offers a length range of 25"-43". Wondering which camper tiedowns fit your truck? Call us— at (866) 305-8309 OR visit our Torklift selector tool.